Hanoverville is an unincorporated community in Northampton County, Pennsylvania, United States. 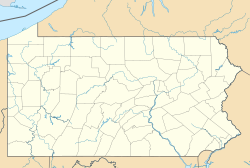 Hanoverville is located on Township Line Road south of Hanoverville Road at the tripoint of Bethlehem, Hanover, and Lower Nazareth townships. ^ "Hanoverville". Geographic Names Information System. United States Geological Survey. This page was last edited on 14 January 2018, at 23:47 (UTC).